GIVE THEM A GIFT THEY'LL REALLY LOVE! Great gifts begin at Be Theatre! You will be their favorite person in the world with this thoughtful, artsy and unique gift! If we don't hear from you, we will contact you through the email address you provide on your paypal account. Or... just bypass the online option and give us a call at 325.716.4125! Our General Admission tickets for full length productions are $20 per adult, $18 for Students/Seniors/Military. 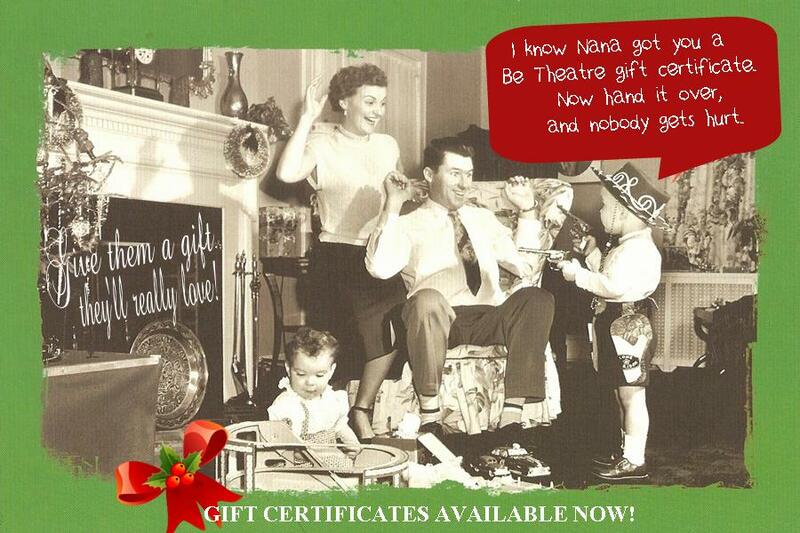 Purchase our gift certifates this holiday season and receive the $18 price for every ticket. Gift certificates are availble in 4 different amounts as specified below. The certificate is a beautiful, color 8.5X11 certificate on linen paper. We can also email you the file and you can print it from home if you prefer.